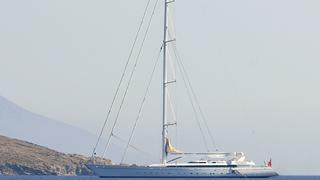 Mirabella V became a larger part of my inner thoughts around 1996 when, at meetings with my old friend Bob Derecktor, it became clear that my ideas for a large sloop could be realised. Bob did not live long enough to share in the actual creation, but without him I’m not sure I would have continued with the project. I then turned to Ron Holland, who created the profile that produced for my family the excitement necessary to leave reality behind and go for it. So started four years of study on the practicalities of building a sloop of this size, complicated by my brief to Ron that I wanted it to perform well upwind and be built in composite. With the help of Julian Smith of High Modulus, who had been assisting since my early days with Bob Derecktor, we slowly solved the many problems surrounding the creation of a 75 metre composite hull that must withstand the forces from a 90 metre rig and a 150 tonne keel 10 metres deep when sailing, lifting to 4 metres for port entry. It was clear that it would flex somewhat, but we needed High Modulus and Ron Holland Design to confirm that it was manageable. To reassure us that our calculations were correct, we went to VT Shipbuilding, which had been building minesweepers in composite for some time, and its experienced engineering departments helped to bring it all together. Mirabella V achieves all that I asked for: she is fast and yet provides all the comforts of a motor yacht without the noise and fuel consumption. To my knowledge, no other sailboat delivers this combination and in addition has a spacious sky deck for lounging, participating in the helming or seating 18 to 20 for a barbecue lunch or starlit dinner followed by a surround-sound widescreen film. 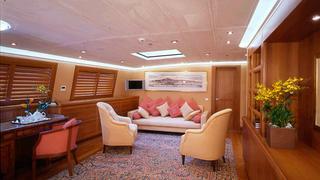 Twenty people can sit around the freshwater spa on the foredeck, and a mast lift for three offers views far into the distance. The yacht is the largest built in composite and is believed to be the largest composite structure in the world. Mirabella V has now been renamed M5 and is undergoing an extensive refit at Pendennis Plus in Falmouth, UK, which will involve redesigning the stern and extending it by 3 metres, adapting both exterior and interior to the new owner’s needs, replacing the main engines and generators and upgrading many other systems, overhauling the mast and rig and repainting the hull. The refit is expected to be completed in 2013.